Has the political climate in the United States got you down? Wondering what you can do to help? Want to hear from diverse voices who are knowledgeable about the issues at hand and who are living alongside the rest of us, trying to make it one day at a time? “Nasty Women: Feminism, Resistance, and Revolution in Trump’s America,” edited by Samhita Mukhopadhyay and Kate Harding, is a phenomenal read. I actually stumbled upon this book online a while back, and was excited for the chance to read it. My library didn’t have a copy on order yet, so I did what all good readers who don’t want to spend money at the bookstore do: I suggested it be added to the library’s collection! Sure enough, it was. After ordering it back in October, I was able to pick it up about a month later and be the first to read this library copy. I am so glad I read this book. It made me feel, well… better. Less hopeless. Stronger. More fierce. More ready than ever to not give up and not back down. Since my library didn’t own a copy, I put in an interlibrary loan request, and the book arrived shortly after from the library at St. Lawrence University. The really interesting thing about this book is how new it is; it was released in October 2016, making it less than a year old. It speaks on a lot of history, but also includes a lot of relevant, very recent information. I don’t know that I’ve ever read such an up-to-date book. 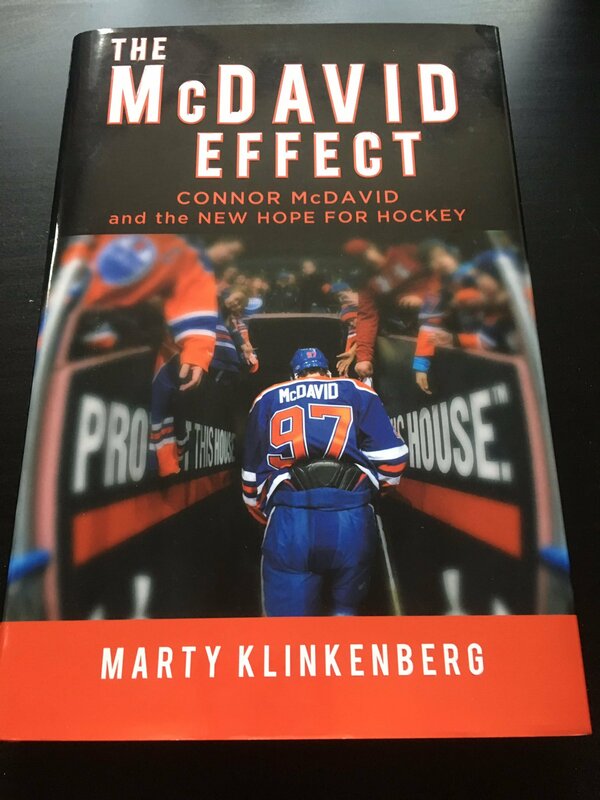 Although the title of this book starts with “The McDavid Effect,” it is not just about Connor McDavid. Instead, it is about McDavid and his path through junior hockey and into the NHL, even through his rookie season, yes; but it is also about the Edmonton Oilers franchise, then and now. It is a captivating story that discusses the history of the Oilers franchise, their glory years, their downfall, and now, the arrival of McDavid and the new hope that it has brought to the city & franchise. It took me about two weeks to read this book, if only because I wanted to take my time and really digest it. There’s a lot of information here, starting with the historical context of Islamophobia – not just in the United States – and leading up to the times that casual Islamophobia ran free under President Obama.